The original kitchen was a fairly typical 1970s kitchen, with the eating counter on the peninsula a forward nod to the more integrated kitchen/family room layout that fits with most of our current lifestyles. 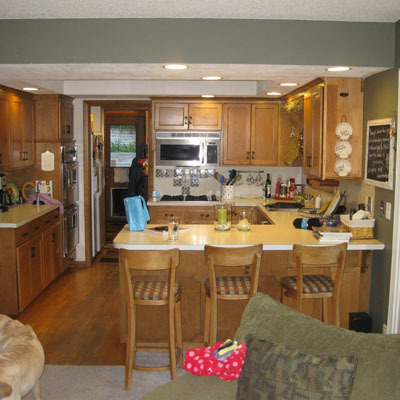 As can be seen, every square inch of this kitchen was in use, and they had already adapted slightly by relocating the refrigerator from the kitchen proper to the hall by the garage entry to make room for an additional shelf in the kitchen. Even with this move, this kitchen was really pushing it to work for a family of five who enjoyed spending time together preparing food!